Since the rise of the internet in the early 1990s, the most obvious benefit offered by educational technology has been its potential ubiquity or the ability to learn anywhere, anytime. In development contexts, sceptics have asserted that the ‘digital divide’ restricts this benefit to the privileged few, as only 40 per cent of the world’s population is online. But such analysis neglects the rapid pace of change in extending mobile (and mobile, 3G-based broadband networks) access in low- and middle-income countries. In many nations, the majority of web users use only mobile phones; the countries with the highest rates include Egypt (70 per cent) and India (59 per cent). In Africa, 85 per cent of the mobile-only web users access the internet with a ‘feature phone’, a device offering some but not all of the features of a smartphone. In high-income nations, a large minority of mobile web users are mobile-only, including the United States (25 per cent). Where, in many low- and middle-income nations, the mobile-only tend to be aged under 25, in high-income countries, particularly the United States, many mobile-only users are older people and many come from lower-income households (ITU, 2013). These statistics imply that for educational technology to be deployed effectively in the contexts of low-, middle- and high-income countries, a mobile-first strategy building on open, low-cost standards and tools is needed. Education researchers Bill Cope and Mary Kalantzis (2012) have described the ways in which technology transforms the economy of effort in education, enabling us to afford (both literally and figuratively) not only to make learning available anywhere, anytime, but also to provide learners with formative assessment and recursive feedback as they work. 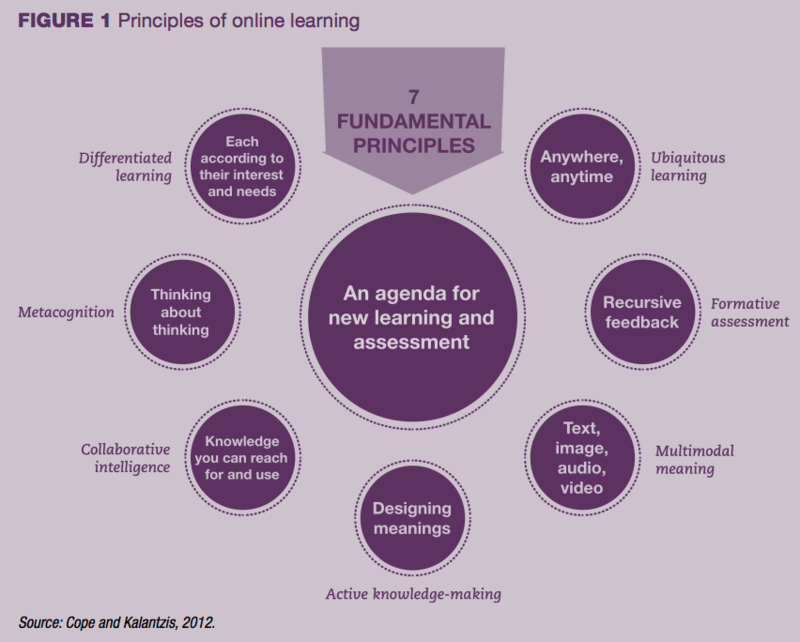 In this economy of ‘new learning’ (see figure), learners use technology actively to construct knowledge, designing meanings using multiple media at their disposal. By working together collaboratively, every learner is also a peer and teacher contributing to collective knowledge and intelligence that can be used to further thinking and action as well as encouraging ‘metacognition’ (thinking about thinking). Unlike education in the industrial age, which levelled ‘one-size-fits-all’ assumptions, new learning can afford to differentiate based on pre-existing knowledge, competencies and skills. In a new learning system, learners create together, giving each other feedback (and even feedback on feedback), sharing their inspirations and discoveries. Within their knowledge communities, they are connected and can work at their own pace, according to their own interests and capabilities. They are inspired to create through embedding sound, image and video within their texts for digital storytelling, situation reports, operational plans and more. This collaborative, flexible, motivating, participatory and supportive approach is not simply a nicer, kinder and gentler form of learning. Its pedagogical patterns closely emulate the core competencies of 21st century humanitarian workers, who are expected to be able to manage complex, overlapping knowledge flows, to work in networked configurations (rather than command-and-control structures) and to use participatory methodologies to partner with affected populations. If the ways humanitarians teach and learn do not explicitly develop these competencies, then formal education efforts will become increasingly ineffective. The amazing economy of effort afforded by educational technology is the only sustainable way to transform learning systems to meet the challenges of today’s volatile, uncertain, complex and ambiguous world. Written by Reda Sadki. First published in the World Disasters Report 2013: Focus on technology and the future of humanitarian action. Photo: Buddhist monks on a slow boat at the Mekong River near the border of Laos-Cambodia, during a workshop to increase awareness regarding dolphin and fish conservation. There are only 12 dolphins left in this area and a few more further down stream. The temples of Laos were once seen as “universities” for monks. Lao monks are highly respected and revered in Lao communities. Photography © Ben Thé Man/Flickr.com.